LING AND TING ARE TWINS. THEY HAVE THE SAME BROWN EYES. THEY HAVE THE SAME PINK CHEEKS. THEY HAVE THE SAME HAPPY SMILES. "WE ARE NOT EXACTLY THE SAME," LING SAYS. TING LAUGHS BECAUSE SHE IS THINKING THE SAME THING. Their differences must all be on the inside, until the identical twins go to get their identical haircuts. Ling sIts perfectly still and gets a perfect haircut with perfect straight bangs. Ting, however, can't sit still. She fidgets with her feet and hands. And when the tiny trimmings from her bangs hit her nose, she sneezes. With that sneeze, the startled barber's shears cut a big uneven whack out of hers. Now the twins are not exactly alike anymore! 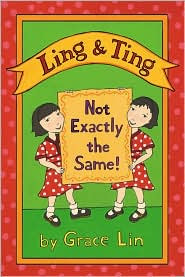 In the six short chapters of her 2011 Theodore Seuss Geisel-Award-winning beginning reader, Ling & Ting: Not Exactly the Same! (Little, Brown, 2010) Grace Lin shows all the ways Ling and Ting are not alike. In one chapter," Ling just cannot manage to eat with chopsticks; Ting suggests that she could use her own deftly welded chopsticks to feed her sister, but Ling has a better idea--a fork! Ting prefers fairy tale books from the library, but Ling only wants nonfiction books about dogs. And in doing card tricks, both girls strike out as Ting can't find the right card for her card trick, but by the time she realizes she's done the trick wrong, Ling has forgotten the card she's supposed to remember anyway. "YOUR DUMPLINGS ARE DUMP-LINGS," SHE SAYS. "MINE ARE DUMP-TINGS!" Viva la difference! in Lin's engaging little essay on winning at twindom. With starred reviews from both Booklist and School Library Journal and a Geisel honor award for one of the best easy readers of the year, Lin's kickoff entry for what should be a winning twin series is like getting two for the price of one for emergent readers.